disclosure: thank you, masked beauty for providing me the face masks featured in today’s post. as per usual, all opinions are my own! unfortunately, the price tag on the aforementioned spa day is not always realistic. after a stressful workweek, i was eager to unwind and decompress. i invited my girlfriend and fellow blogger, ana luiza over for an at-home spa day! we had a blast lounging in pajamas, sipping tea, and trying new face masks, graciously provided by masked beauty. hosting an at-home spa day is easier (and less expensive) than i had imagined. i invited ana luiza to come over in her most comfortable lounge-wear. (she opted for a cozy t-shirt dress, and i wore pajama pants and a tee.) a bathrobe and slippers would also be fun to include! i had light bites and tea, makeup-removing wipes, face towels, and an assortment of face masks arranged upon ana luiza’s arrival. one item that seemed to be missing? an essential oil diffuser. a diffuser can help reduce stress and enhance sleep—i would love to incorporate one into my nighttime routine! serving “detox” water can also help your home feel (and taste) like a spa. two of my favorite flavored water recipes are: water + mint + cucumber + lemon, and/or water + berries + basil. both are delicious and refreshing. any excuse to drink more water is a win in my book! after you have “set the spa mood,” it is time to begin your treatments. first, ana luiza and i took off our makeup with makeup-removing wipes. (these wipes are my favorite.) next, we washed our faces with cleanser to provide a clean slate for our subsequent products. we were then ready to apply our masked beauty face masks! masked beauty graciously sent three masks for us to try, each of which target specific skincare needs. the exfoliating chocolate and coffee mask helps tone your skin, by removing dry, flaky patches. (i am wearing the chocolate and coffee mask in the photos below.) 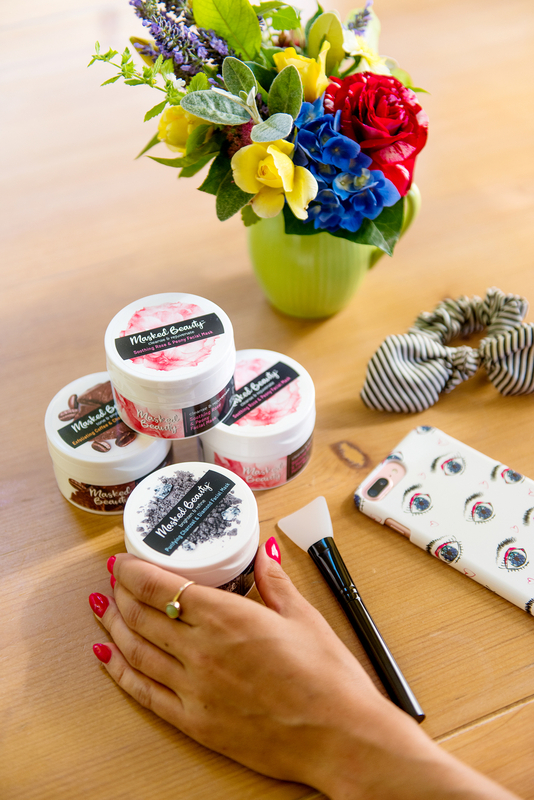 the charcoal and diamond face mask works to brighten and refine your skin’s texture. (ana luiza is wearing this mask.) the third mask (not pictured, unfortunately) is a soothing rose and peony mask. i have used this mask several times over the past two weeks, as it helps revitalize dry, tired-looking skin. we left our face masks on for ten minutes, rinsed them, and applied face moisturizer. moisturizer is incredibly important post-mask, as some masks can be drying to your skin. (i have not experienced excessive drying with masked beauty products, but in general, my skin is on the drier side.) 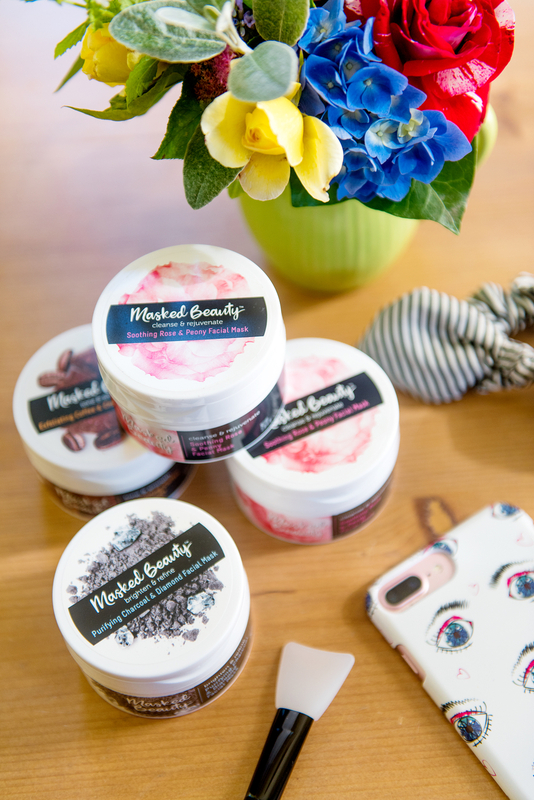 if you aren’t familiar with masked beauty products, pop over to their website. you can also find them at your local safeway and albertsons. they will soon be available at fred meyer, too! 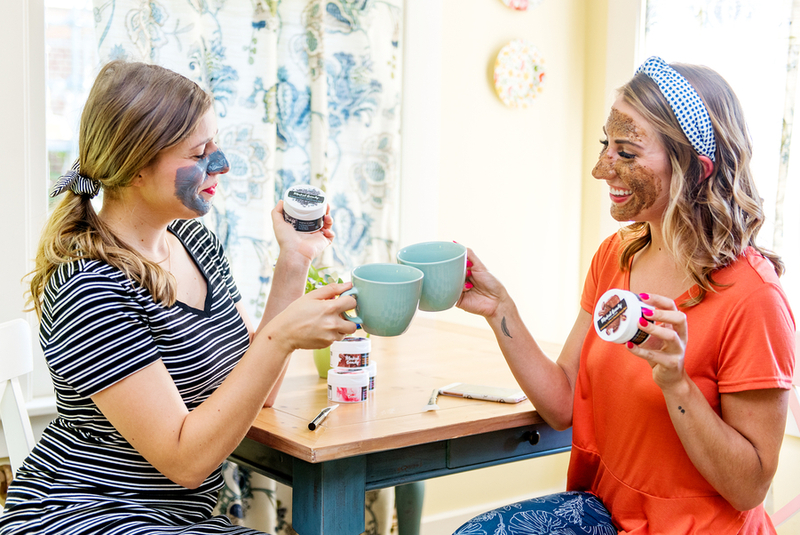 have you hosted an at-home spa party? what spa treatments did you offer? i hope to host a nail party very soon! Thank you! I hope you’re having a great weekend.